Pretty straightforward, but I'm not entirely happy with the gradient on the green gems now that I'm reviewing the pics. Definitely need to add a few more intermediate tones to them! 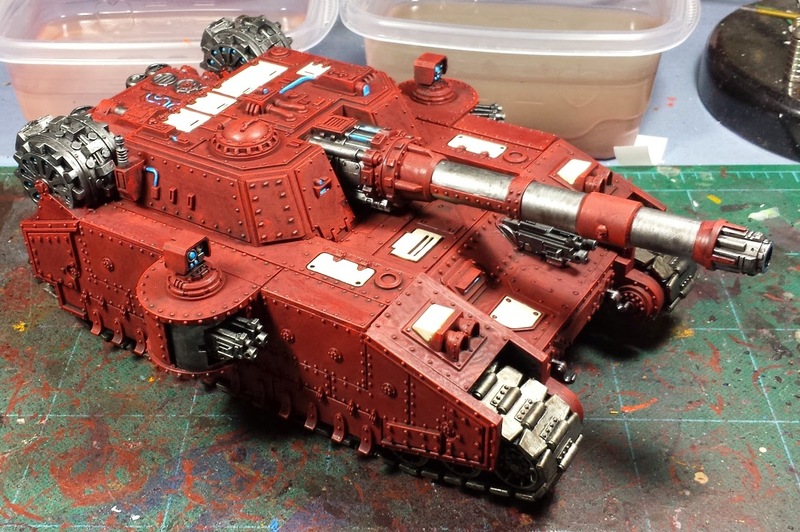 I've been slogging along on the Shadowsword for the Spireguard as well, got all the basic colors laid in, now it's time to start the interminable rivet painting step... Oof! Nice. Pictures are all that matter. Wordz iz 4 smrt peepole. I agree the green gems could use a bit more gradients, but the squad looks very intimidating! Looking good! I've been meaning to ask, you wouldn't happen to have a spare boarding shield, would you? @Joe B: Thanks! Aye, a more smooth transition will definitely help the look. We'll see if I can refrain from gibbering too much through the riveting process. Hah! @Davetaylor: Cheers man! You betcha, just shot an email your way. Hahah, agree on the photos. I might comment on blogs a lot, but I generally don't if there isn't photos! Give me what I want! MINI PHOTOS! Tank is looking epic already! Yes on more gem paint. Otherwise, those fellows look way better than the typical warning striped style shields I've seen previously. Too many rivets. Do they really need to be individually picked out? Rivet painting is very therapeutic. @Greg Hess: I'm the same way, man. Cheers! @Dai: Indeed - it's just too stark a change in greens, more blending is required! I just had to pipe in - I love what you have done with that 'Breacher Siege Squad'. I liked the shields before but now... far out. Brilliant mix of colours.